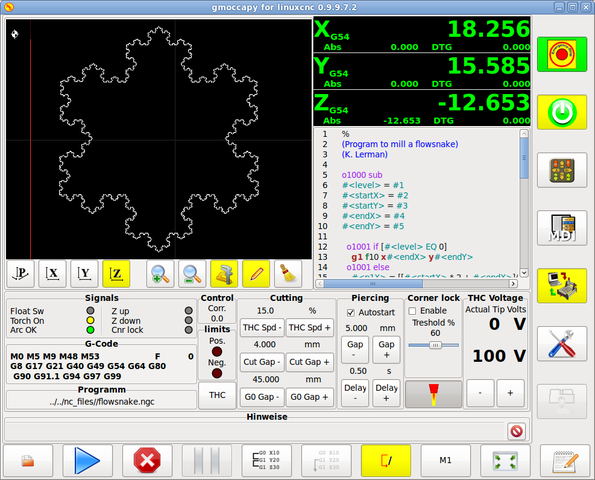 GMOCCAPY is a GUI for linuxcnc, designed to be used with a touch screen, but can also be used on normal screens with a mouse or hardware buttons and MPG wheels, as it presents HAL Pins for the most common needs. Please find more information in the following. It has support for integrated virtual keyboard (onboard or matchbox-keyboard), so there is no need for a hardware keyboard or mouse, but it can also be used with that hardware. 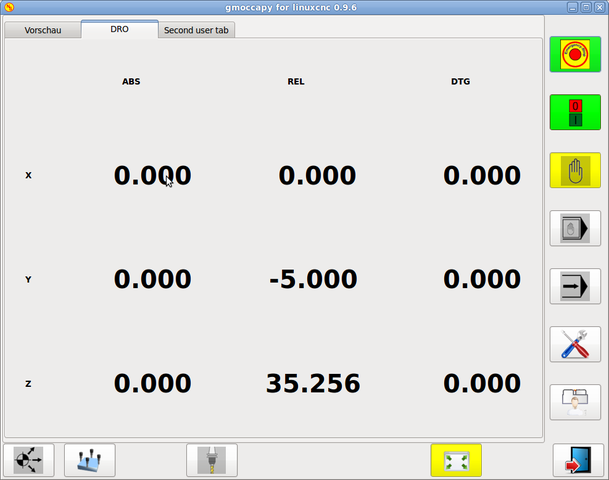 Gmoccapy offers a separate settings page to configure most settings of the GUI without editing files. gmoccapy can be localized very easy, because the corresponding files are separated from the linuxcnc.po files, so there is no need to translate unneeded stuff. The files are placed in /src/po/gmoccapy. Just copy the gmoccapy.pot file to something like fr.po and translate that file with gtranslator or poedit. After a make you got the GUI in your preferenced language. Please publish your translation, so it can be included in the official packages and be published to other users. At the Moment it is available in English, German, Spanish, Polish, Serbian and Hungarian. Feel free to help me to introduce more languages, nieson@web.de. If you need help, don’t hesitate to ask. The minimum screen resolution for gmoccapy, using it without side panels is 979 x 750 Pixel, so it should fit to every standard screen. Beginning with LinuxCNC 2.6 gmoccapy is included in the standard installation. So the easiest way to get gmoccapy on you controlling PC, is just to get the actual ISO and install from the CD / DVD /USB-Stick. You will receive updates with the regular deb packages. You will get a similar screen to the following: The design may variate depending on your config. There is really not to much to configure just to run gmoccapy, but there are some points you should take care off if you want to use all the features of the GUI. The names should explain the main intention of the different INI Files. If you use an existing configuration of your machine, just edit your INI according to this document. If you want to use MACROS, don’t forget to set the path to your macros or subroutines folder as described below. 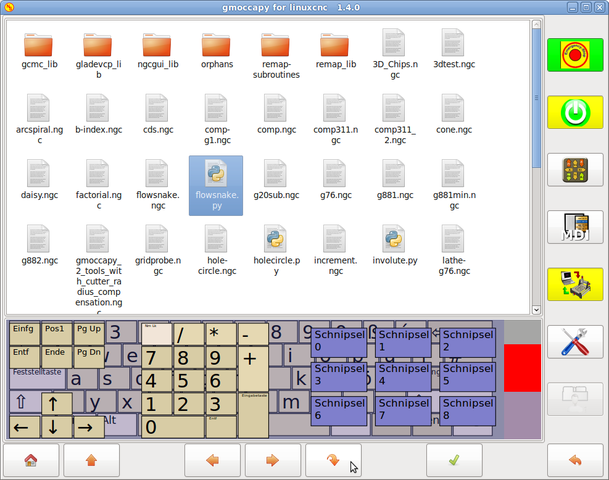 The most important part is to tell LinuxCNC to use gmoccapy, editing the [DISPLAY] section. The line PREFERENCE_FILE_PATH gives the location and name of the preferences file to be used. In most cases this line will not be needed, it is used by gmoccapy to store your settings of the GUI, like themes, DRO units, colors, and keyboard settings, etc., see SETTINGS for more details. If no path or file is given, gmoccapy will use as default <your_machinename>.pref, if no machine name is given in your INI File it will use gmoccapy.pref The file will be stored in your config dir, so the settings will not be mixed if you use several configs. If you only want to use one file for several machines, you need to include PREFERENCE_FILE_PATH in your INI. Sets the default linear velocity in machine units per second. Sets the value of the max velocity for jogging in machine units per second. the first line set the screen layout to control a lathe. The second line is optional and will switch the X axis in a way you need for a back tool lathe. Also the keyboard shortcuts will react in a different way. 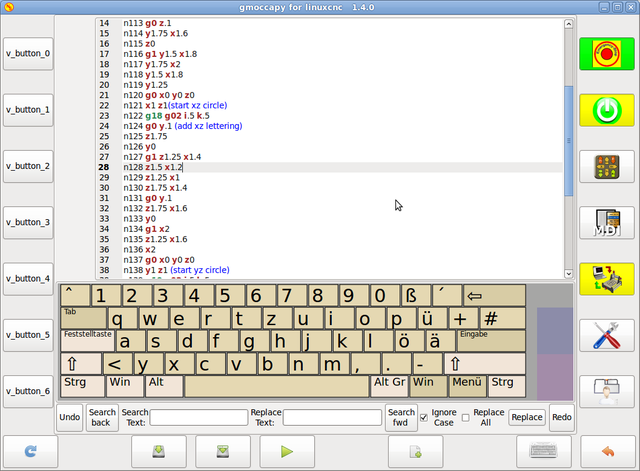 You can add embedded programs to gmoccapy like you can do in axis, touchy and gscreen. All is done by gmoccapy automatically if you include a few lines in your INI file in the DISPLAY section. represents the name of the tab or side panel, it is up to you what name you use, but it must be present! is the command to execute, i.e. will add a the panel manual-example.ui, include a custom python handler, hitcounter.py and make all connections after realizing the panel according to manual-example.hal. Gmoccapy has the ability to create hal driven user messages. To use them you need to introduce some lines in the [DISPLAY] section of the INI file. MESSAGE_TEXT = Text can be <small>small</small>, <big>big</big>, <b>bold</b>, <i>italic</i>, and even be <span color="red">colored</span>. sets the path to search for macros and other subroutines. You can add macros to gmoccapy, similar to touchy’s way. 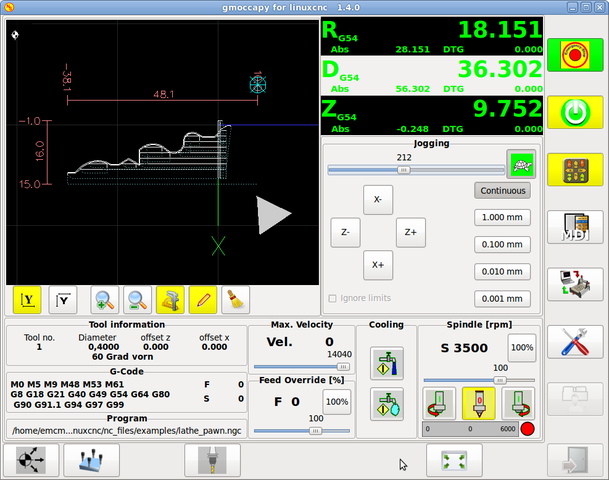 CNC programs in MDI mode, by just pushing one button. This will add 5 macros to the MDI button list. Please note, that maximal 9 macros will appear in the GUI, due to place reasons. But it is no error placing more in your INI file. The name of the file must be exactly the same as the name given in the MACRO line. So the macro i_am_lost will call the file i_am_lost.ngc. The code in between sub and endsub will be executed by pushing the corresponding macro button. You will find the sample macros in macros folder placed in the gmoccapy sim folder. after pushing the execute macro button, you will be asked to enter the values for X-pos Y-pos Z-pos and the macro will only run if all values have been given. Sets the maximal velocity of the machine, this value will also take influence to default velocity. gmoccapy exports several hal pin to be able to react to hardware devices. 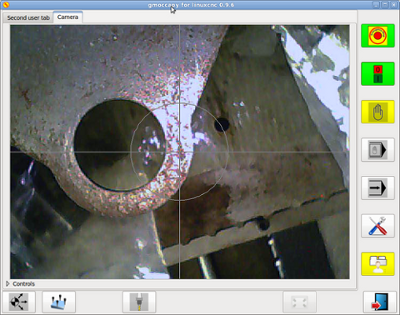 The goal is to get a GUI that may be operated in a tool shop, completely/mostly without mouse or keyboard. You will have to do all connections to gmoccapy pins in your postgui.hal file, because they are not available before loading the GUI completely. The screen has two main button lists, one on the right side an one on the bottom. The right handed buttons will not change during operation, but the bottom button list will change very often. The buttons are count from up to down and from left to right beginning with "0". as the buttons in the bottom list will change according the mode and other influences, the hardware buttons will activate different functions, and you don’t have to take care about switching functions around in hal, because that is done completely by gmoccapy! The sens of this is to be able to use the screen without an touch panel, or protect it from excessive use by placing hardware buttons around the panel. 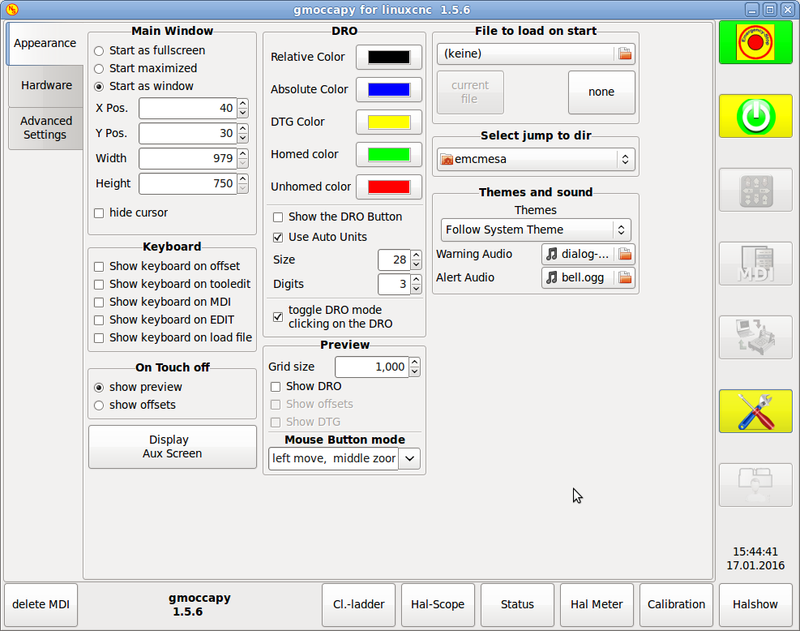 All sliders from gmoccapy can be connected to hardware encoder or hardware potmeters. The float pin do accept values from 0.0 to 1.0, being the percentage value you want to set the slider value. If you use both connection types, do not connect the same slider to both pin, as the influences between the two has not been tested! Different sliders may be connected to the one or other hal connection type. Please be aware, that for the jog velocity depends on the turtle button state, it will lead to different slider scales depending on the mode (turtle or rabbit). Please take also a look to jog velocities and turtle-jog hal pin for more details. All axis given in the INI File have a jog-plus and a jog-minus pin, so hardware momentary switches can be used to jog the axis. 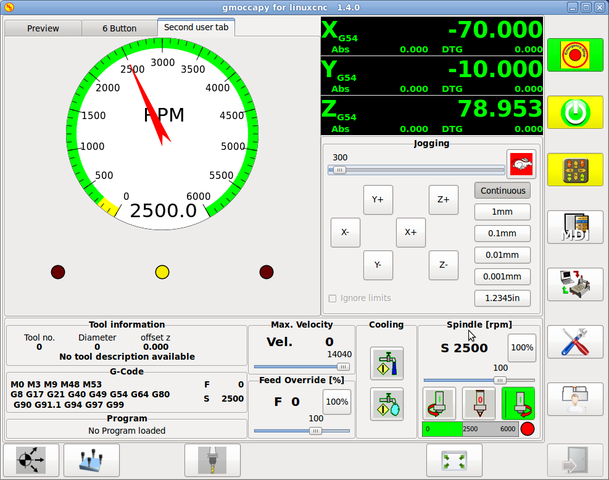 The jog velocity can be selected with the corresponding slider. 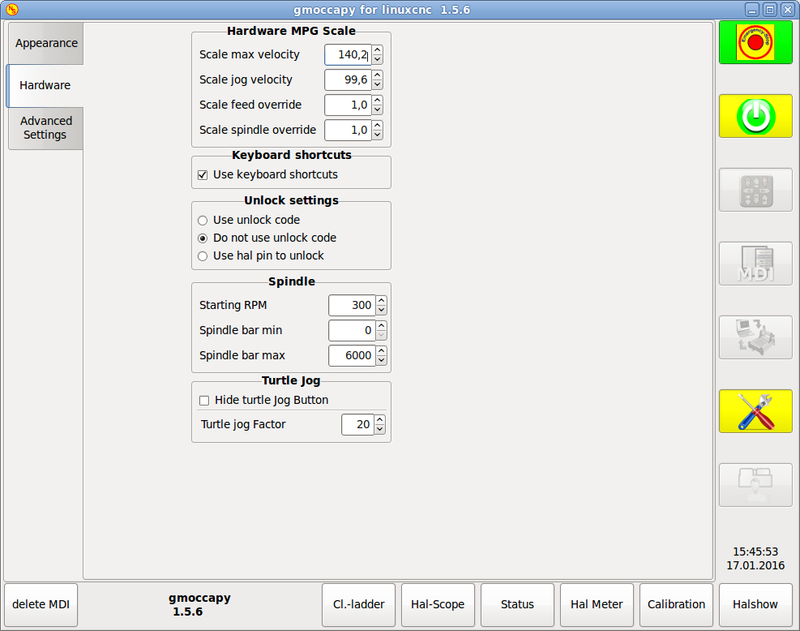 The scale of the slider will be modified if the turtle button (the one showing a rabbit or a turtle) has been toggled. If the button is not visible, it might have been disabled on the settings page. If the button shows the rabbit-icon, the scale is from min to max machine velocity. If it shows the turtle, the scale will reach only 1/20 of max velocity by default. The used divider can be set on the settings page. So using a touch screen it is much easier to select smaller velocities. The jog increments are selectable through hal pins, so a select hardware switch can be used to select the increment to use. There will be a maximum of 10 hal pin for the increments given in the INI File, if you give more increments in your INI File, they will be not reachable from the GUI as they will not be displayed. jog-inc-0 is unchangeable and will represent continuous jogging. to be able to use a key switch to unlock the settings page the following pin is exported. The settings page is unlocked if the pin is high. To use this pin, you need to activate it on the settings page. gmoccapy.error is an bit out pin, to indicate an error, so a light can lit or even the machine may be stopped. It will be reseted with the pin gmoccapy.delete-message. gmoccapy.delete-message will delete the first error and reset the gmoccapy.error pin to False after the last error has been cleared. Messages or user infos will not affect the gmoccapy.error pin, but the gmoccapy.delete-message pin will delete the last message if no error is shown! The values may not be very accurate, if you are working with subroutines or large remap procedures, also loops will cause different values. This pin are provided to use gmoccapy’s internal tool change dialog, similar to the one known from axis, but with several modifications, so you will not only get the message to change to tool number 3, but also the description of that tool like 7.5 mm 3 flute cutter. The information is taken from the tool table, so it is up to you what to display. This pins allows you to show the active tool offset values for X and Z in the tool information frame. You should know that they are only active after G43 has been send. just connect them like so in your postgui hal. Please note, that gmoccapy takes care of its own to update the offsets, sending an G43 after any tool change, but not in auto mode! So writing a program makes you responsible to include an G43 after each tool change! 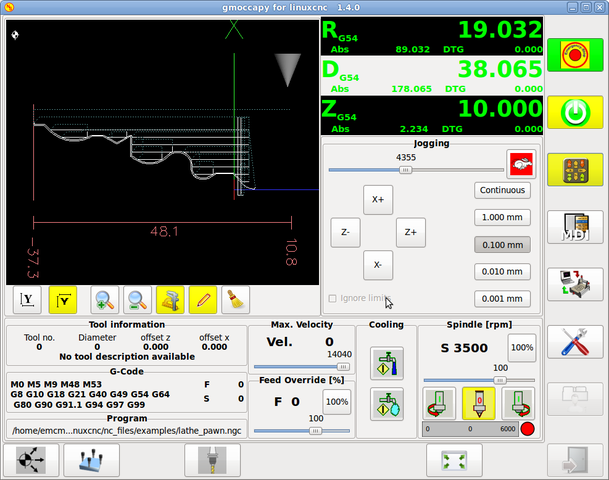 Gmoccapy offers an integrated auto tool measurement. To use this feature, you will need to do some additional settings and you may want to use the offered hal pin to get values in your own ngc remap procedure. 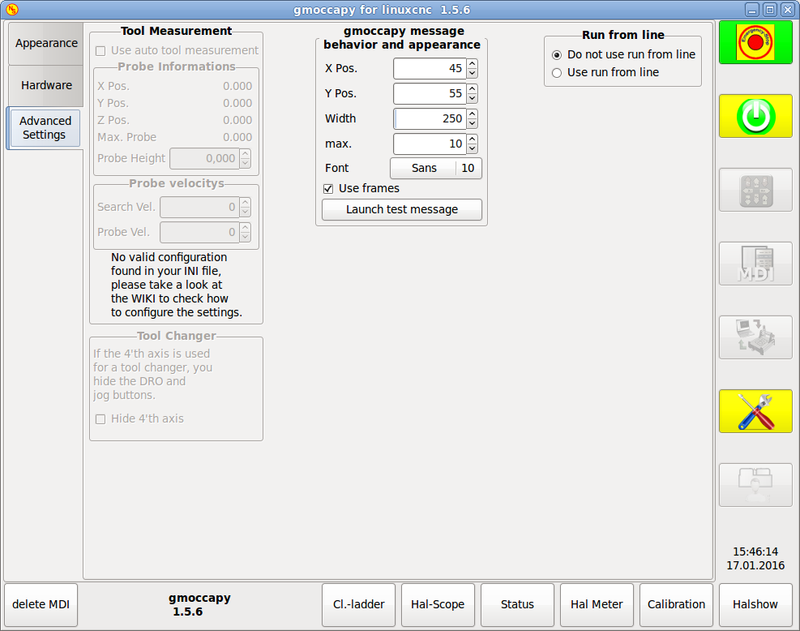 Tool Measurement in gmoccapy is done a little bit different to many other GUI. With the first given tool change the tool will be measured and the offset will be set automatically to fit the block height. The advantage of the gmoccapy way is, that you do not need a reference tool. Your program must contain a tool change at the beginning! The tool will be measured, even it has been used before, so there is no danger , if the block height has changed. There are several videos showing the way to do that on you tube. The pins are mostly used to be read from a gcode subroutine, so the code can react to different values. The position of the tool sensor and the start position of the probing movement, all values are absolute coordinates, except MAXPROBE, what must be given in relative movement. # The start point for all. and give an unlock code, witch is 123 as default. If you want to change it at this time you will have to edit the hidden preference file, see the display section for details. way for the user to set the starting options without the need to touch code. If you select start as window the spinboxes to set the position and size will get active. One time set, the GUI will start every time on the place and with the size selected. not have any influence on the settings. hide the cursor does allow to hide the cursor, what is very useful if you use a touch screen. If this section is not sensitive, you have not installed a virtual keyboard, + supported are onboard and matchbox-keyboard. If the keyboard layout is not correct, i.e. clicking X gives Z, than the layout has not been set properly, related to your locale settings. so that the layout is set automatically on starting. For matchbox-keyboard you will have to make your own layout, for a German layout ask in the forum. give the option to show the preview tab or the offset page tab if you enter the touch off mode by clicking the corresponding bottom button. As the notebook tabs are shown, you are able to switch between both views in any case. By clicking this button a additional window will be opened. This button is only sensitive, if a file named gmoccapy2.glade is located in your config folder. You can build the Aux Screen using Glade. will allow you to display additional buttons on the left side of the DRO. * and one button to toggle the units from metric to imperial and vice versa. You can change through the DRO modes (absolute, relative, distance to go) by clicking on the DRO! sets the number of digits of the DRO from 1 to 5. Imperial will show one digit more that metric. So if you are in imperial machine units and set the digit value to 1, you will get no digit at all in metric. if not active, a mouse click on the DRO will not take any action. Sets the grid size of the preview window. Unfortunately the size has to be set in inches, even if your machine units are metric. We do hope to fix that in a future release. Will show also the DTG (direct distance to end point) in the preview, only if Show DRO is active and not fullsize preview. With this combobox you can select the button behavior of the mouse to rotate, move or zoom within the preview. The mouse wheel will still zoom the preview in every mode. If you select an element in the preview, the selected element will be taken as rotation center point. Select the file you want to be loaded on start up. In other GUI changing this was very cumbersome, because the users where forced to edit the INI File. If a file is loaded, it can be set by pressing the current button to avoid that any program is loaded at start up, just press the None button. you can set here the directory to jump to if you press the corresponding button in the file selection dialog. This lets the user select what desktop theme to apply and what error and messages sounds should be played. By default "Follow System Theme" is set. For the different Hal Pin to connect MPG Wheels to, you may select individual scales to be applied. The main reason for this was my own test to solve this through hal connections, resulting in a very complex hal file. Imagine a user having an MPG Wheel with 100 ipr and he wants to slow down the max vel from 14000 to 2000 mm/min, that needs 12000 impulses, resulting in 120 turns of the wheel! Or an other user having a MPG Wheel with 500 ipr and he wants to set the spindle override witch has limits from 50 to 120 % so he goes from min to max within 70 impulses, meaning not even 1/4 turn. Some users want to jog there machine using the keyboard buttons and there are others that will never allow this. So everybody can select whether to use them or not. Default is to use keyboard shortcuts. The start RPM sets the rpm to be used if the spindle is started and no S value has been set. With the MIN and MAX settings you set the limits of the spindle bar shown in the INFO frame on the main screen. It is no error giving wrong values. If you give a maximum of 2000 and your spindle makes 4000 rpm, only the bar level will be wrong on higher speeds than 2000 rpm. This settings will have influence on the jog velocities. hide turtle jog button will hide the button right of the jog velocity slider, if you hide this button, please take care that it shows the rabbit icon, otherwise you will not be able to jog faster than the turtle jog velocity, which is calculated using the turtle jog factor. This button can be activated using the turtle-jog hal pin. If this part is not sensitive, you do not have a valid INI file configuration to use tool measurement. Use auto tool measurement : If checked, after each tool change, a tool measurement will be done, the result will be stored in the tool table and an G43 will be executed after the change. Max. Probe = is the distance to search for contact, an error will be launched, if no contact is given. The distance has to be given in relative coordinates, beginning the move from Z Pos., so you have to give a negative value to go down! 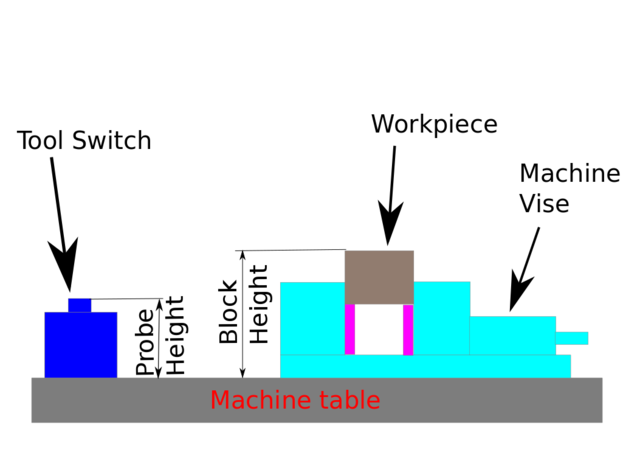 Probe Height = is the height of your probe switch, you can measure it. Just touch off the base, where the probe switch is located and set that to zero. Then make a tool change and watch the tool_offset_z value, that is the hight you must enter here. Search Vel. = The velocity to search for the tool switch, after contact the tool will go up again and then goes toward the probe again with probe vel, so you will get better results. If your 4’th axis is used in a tool changer, you may want to hide the DRO and all the other buttons related to that axis. This will display small popup windows displaying the message or error text, the behavior is very similar to the one axis uses. You can delete a specific message, by clicking on it’s close button, if you want to delete the last one, just hit the WINDOWS key on your keyboard, or delete all messages at ones with <STRG><SPACE>. X Pos = The position of the top left corner of the message in X counted in pixel from the top left corner of the screen. Y Pos = The position of the top left corner of the message in Y counted in pixel from the top left corner of the screen. max = The maximum messages you want to see at ones, if you set this to 10, the 11th message will delete the first one, so you will only see the last 10 ones. use frames = If you activate the checkbox, each message will be displayed in a frame, so it is much easiere to distinguish the messages. But you will need a little bit more space. The button launch test message will just do what it is supposed to, it will show a message, so you can see the changes of your settings without the need to generate an error. You can allow or disallow the run from line. This will set the corresponding button insensitive (grayed out), so the user will not be able to use this option. It is not recommend to use run from line, as LinuxCNC will not take care of any previous lines in the code before the starting line. So errors or crashes are very probably. If this button is active, nearly every button press or relevant action of LinuxCNC will be logged in the ALARM history. This is very useful for debugging. 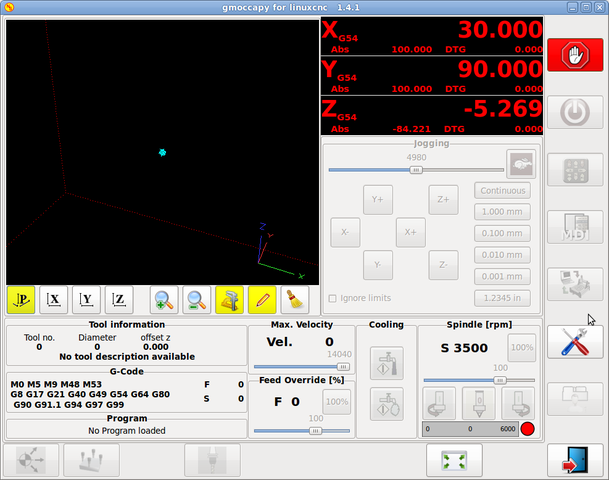 If in the INI File LATHE = 1 is given, the GUI will change its appearance to the special needs for a lathe. Mainly the Y axis will be hidden and the jog buttons will be arranged in a different order. As you see the R DRO has a black background and the D DRO is gray. This will change according to the active G-Code G7 or G8. The active mode is visible by the black background, meaning in the shown images G8 is active. The next difference to the standard screen is the location of the Jog Button. X and Z have changed places and Y is gone. You will note that the X+ and X- buttons changes there places according to normal or back tool lathe. 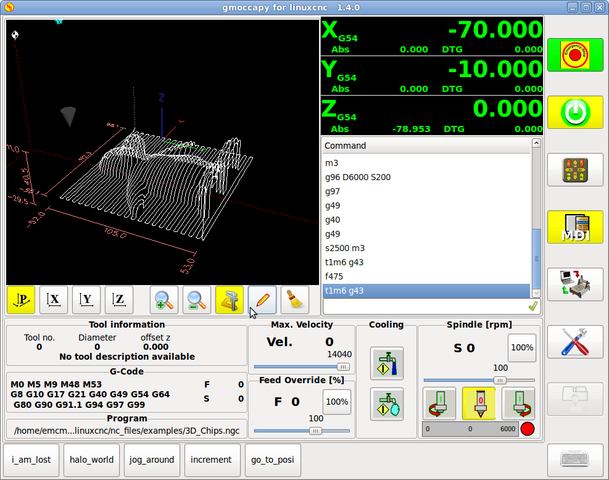 The tool information frame will show not only the Z offset, but also the X offset and the tool table is showing all lathe relevant information. This are videos showing gmoccapy in action, unfortunately the videos don’t show the latest version of gmoccapy, but the way to use it will not change much in the future. I will try to actualize the videos as soon as possible.